By Anthony Crupi . Published on November 01, 2017. America's Team is keeping the ratings wolf from the door. In piecing together the 2017 NFL broadcast schedule, the league's media partners went all-in on the Dallas Cowboys, signing on Jerry Jones's charges to appear in 13 national TV windows. At the midway point in the season, it appears that the "Everything's Bigger" in Texas strategy has gone a long way toward preventing a significant ratings crash. 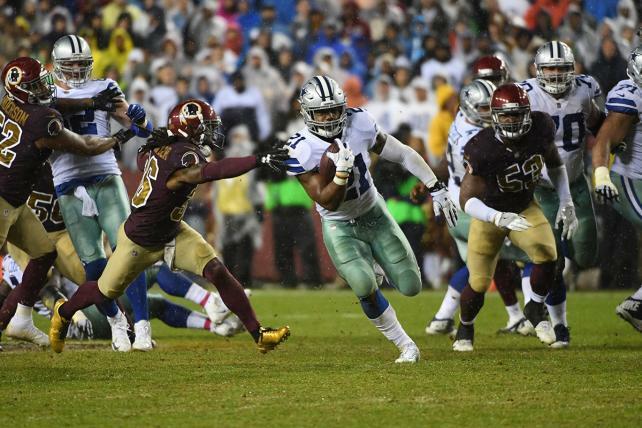 According to Nielsen live-plus-same day data, the Cowboys are once again TV's top draw, averaging 22 million viewers and a 12.4 household rating in their first five coast-to-coast broadcasts. Not only has Dallas factored in the season's highest-rated NFL broadcast -- the Cowboys' lopsided 42-17 loss in Denver on Sept. 17 delivered 26.0 million viewers and a 14.3 HH rating in Fox's Sunday afternoon window -- but the team has managed to put up huge numbers in regional coverage. The top-rated NFL game in Week 4 was the Los Angeles Rams-Dallas single-header on Fox, which beat out all the games in the national windows with an average draw of 20.1 million viewers and an 11.5 household rating … despite airing in only 32 percent of all TV markets. While Dallas's ratings are down 5 percent compared to the year-ago period, when it was averaging 23 million viewers and a 13.1 rating, the franchise has plenty of opportunities to catch up over the balance of the season. The Cowboys are slated to appear in no fewer than eight upcoming nationally-televised games, including the team's traditional Thanksgiving Day Game (CBS has the honors this year) and a Christmas Eve slot against Seattle in Fox's big Sunday afternoon showcase. On the other end of the continuum are the five teams that have been consigned to a single national TV date each: the Rams, 49ers, Browns, Jets, Bills. And then there are the Jaguars, which were effectively made invisible by the league's scheduling committee. Jacksonville's Sept. 24 blowout of Baltimore in London streamed on Yahoo and aired on linear TV only in the two home markets. Trailing Dallas in the ratings win column are the Green Bay Packers, who through five national broadcasts are averaging 20.6 million viewers and an 11.7 rating. Cheeseheads and ad sales executives alike were pained to see quarterback Aaron Rodgers last month go down with a fractured right collarbone; the Packers are scheduled to appear in just three more national windows, but NBC has the right to flex out two of them for other games if it chooses. If Rodgers's ouster casts a shadow over Green Bay's postseason plans, most of the other high-rated NFL teams are still in the playoff hunt. No. 3 Seattle (19.8 million viewers, 11.2 rating) is currently tied with the Rams for top honors in the NFC West, while No. 5 New England (18.8 million viewers, 11.0 rating) and No. 6 Pittsburgh (18.1 million, 10.5 rating) are knotted up with No. 9 Kansas City (15.9 million viewers, 9.4 rating) with an AFC-leading 6-2 record. Of course, there are outliers. Thanks in large part to market size and a fanbase that's prone to fits of masochism, the uncharacteristically lousy New York Giants are presently the No. 7 NFL TV draw (17.6 million viewers, 10.1 rating), while the thoroughly mediocre Cincinnati Bengals occupy the rung below the G-Men with an average draw of 16.4 million viewers and a 9.5 rating. The top 10 is rounded out by a surprisingly lowly (3-5) Oakland Raiders squad (15.8 million viewers, 9.3 rating) and the uninspiring NFC East representatives from the nation's capital (15.7 million, 9.3). With half the season on the books, all NFL national and regional broadcasts are in aggregate averaging 14.9 million viewers and an 8.7 household rating, down 5 percent versus 15.6 million viewers in the year-ago period and off just 4 percent versus the 9.1 rating served up as of last season's midway point. Two NFL packages actually have shown year-to-year growth, as ESPN's "Monday Night Football" is up 5 percent with an average draw of 11.1 million viewers, while the NFL Network's standalone "Thursday Night Football" slate is up 14 percent with 6.33 million viewers. All told, the late Sunday afternoon package on Fox and CBS is down 8 percent year-over-year, with an average draw of 21.5 million viewers. CBS's overall numbers took a hit after it aired a relatively low-rated (15.6 million viewers, 9.1 household rating) Oct. 1 game featuring the Raiders and Broncos; season-to-date, the network's national Sunday window is down 11 percent with an average delivery of 19.3 million viewers across four broadcasts. Also taking it on the chin are the Sunday afternoon regional games and single-headers, which are down 8 percent to 14 million viewers. The NFL's 5 percent ratings dip isn't quite as pronounced as are the overall losses in broadcast prime. Through the first four weeks of the 2017-18 season, the Big Four nets are averaging 6.62 million live-plus-same-day viewers, down 8 percent compared to the year-ago 7.22 million. Of greater concern is the attrition among the 18-to-49 set. Per Nielsen, broadcasters are now averaging a 1.5 rating in the advertiser-coveted demo, which marks a 12 percent drop compared to the year-ago 1.7 rating.